Please be aware that it is possible for the schedule to change. Be sure to read the Conference FAQ page. Contact conference@midwifery.edu for questions or concerns. We have now included a payment by installments options for most of our workshops! Read the terms here. While we will not be able to include an NRP workshop on this April’s schedule, we are working hard to include the topic at future events. to assist in the midwifery management of clients. 1. Discuss external monitoring fetal heart rate and uterine activity. 2. Identify characteristics of fetal heart rate baseline and periodic & episodic changes using NICHD terminology. 3. Interpret fetal heart rate patterns and the interventions needed to manage these patterns. 4. Review fetal heart rate patterns & uterine activity and discuss appropriate assessments and interventions. The description of this workshop is forthcoming. But what if something goes wrong at the birth? Parents ask it, and midwives and student midwives want to know too. Make sure you’re prepared for shoulder dystocia, nuchal hand, cord or arm, abnormal fetal heart tones, uterine rupture, cord prolapse and other unexpected events in this intensive workshop. Skills listed below will be taught, practiced and evaluated in the workshop. Students who show competency in the skills can have them “signed off” by the instructor in the PSGM if desired. Learn and practice the basics of IV placement. Skills listed below will be taught, practiced and evaluated in the workshop. Students who show competency in the skills can have them “signed off” by the instructor in the PSGM if desired. Medications in IVs? Whether it’s common in your practice and you’re looking for the specifics, or it’s a new idea you’re exploring, this workshop has the whens-hows-whats you need. Skills listed below will be taught, practiced and evaluated in the workshop. Students who show competency in the skills can have them “signed off” by the instructor in the PSGM if desired. The description for this workshop is forthcoming. Just the basics–this brief workshop will prepare you to draw and inject medications as directed. Skills listed below will be taught, practiced and evaluated in the workshop. Students who show competency in the skills can have them “signed off” by the instructor in the PSGM if desired. Pharmacology for Midwives offers learners basic principles of pharmacology, pharmacokinetics, and pharmacodynamics in the childbearing year. The regulation of the U.S. Pharmacopeia is discussed, with review of the FDA and federal agencies that oversee research and make recommendations for women and pregnancy. We will review the drugs commonly used by and available to CPMs, including mechanisms of action, safety, indications and contraindications for each. We will also discuss procurement, storage, transfer, and disposal of medications; community standards, national and international competencies; emergency management and communication. What are you prepared for after the baby is born? Postpartum hemorrhage, shock, and retained placenta are covered in this hands-on workshop to make sure you’ll be ready. Skills listed below will be taught, practiced and evaluated in the workshop. Students who show competency in the skills can have them “signed off” by the instructor in the PSGM if desired. This course offers the expertise of highly trained faculty, and uses supplementary text, videos, slides, and role-play to build theoretical knowledge and teach practical skills. A complete syllabus is included with the course. This training comprises one step in the certification process for Doulas of North America (DONA) and fulfills the doula training requirement for MCU students. Class Description: It is the intent of the instructor to instill a love and appreciation for diverse and humble herbs. This course of study is only a starting point for a student to expand their learning and use of the herbs in their everyday lives. Our world will be a brighter place with more wise women using and spreading the word about the power found in growing, gathering, preparing and healing with herbs. 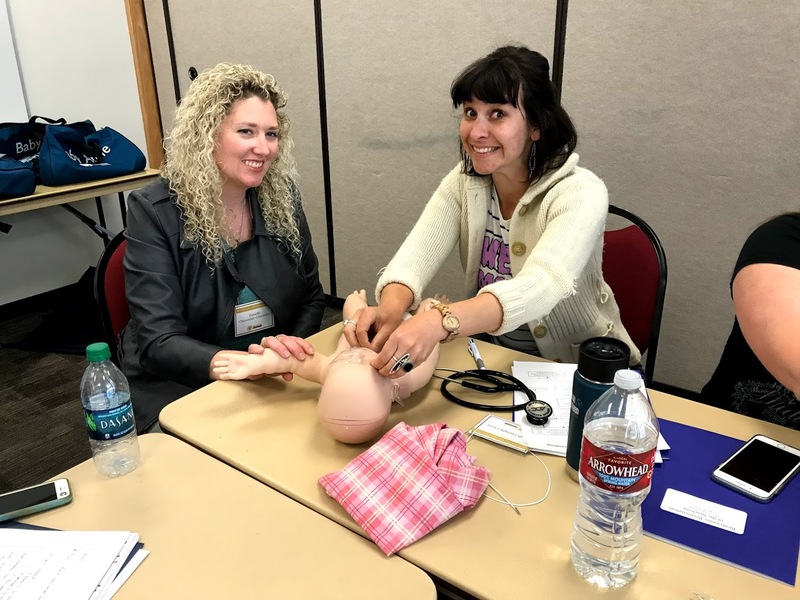 This fast-paced certification course in the lifesaving techniques of Cardiopulmonary Resuscitation is beneficial for midwives, students, doulas and anyone needing professional level certification. American Heart Association certification is included with the class. This workshop price includes supplies but it does NOT include lunch. This course is designed to introduce attendees to Marketing principles, small business strategies and design fundamentals to solicit clients online, in print and in person. Caring for babies is fun! This hands-on workshop goes over newborn exams (initial and routine) as well as gestational age assessment, newborn reflexes, metabolic screening and other newborn procedures. Skills listed below will be taught, practiced and evaluated in the workshop. Students who show competency in the skills can have them “signed off” by the instructor in the PSGM if desired. Get it right, right from the start. This workshop goes over the basic newborn skills for the first hour after birth. Skills listed below will be taught, practiced and evaluated in the workshop. Students who show competency in the skills can have them “signed off” by the instructor in the PSGM if desired. This workshop will be a general overview covering four systems: Nervous, Digestive, Respiratory and Female Reproductive System. This workshop is designed to train you on basic suturing skills and teach you how to evaluate perineal lacerations and perform first and second degree perineal laceration repairs and episiotomy. You will have the opportunity to practice how to use key suturing instruments; you will also practice the major types of knots, and perform simulations of first and second degree perineal laceration repairs and episiotomy. Skills listed below will be taught, practiced and evaluated in the workshop. Students who show competency in the skills can have them “signed off” by the instructor in the PSGM if desired. Prenatal and postpartum mood disorders often carry shame and stigma. As care providers we have a unique role to play in our clients’ lives. We also have the opportunity to build trust that will enable the client to receive the support that they may not receive elsewhere. We want to approach these conversations and assessments with the skill, knowledge and preparation to assure excellent care. When unprepared our communication or inaction may inadvertently place the client at risk of harm. There are risk factors that make awareness of our biases a high priority. We may make assumptions about the lived experience of those who are at risk of marginalization within the dominant culture. We will address signs and symptoms of prenatal and postpartum mood disorders, explore evidence-based treatments within the scope of midwifery practice, common medications prescribed to clients by other clinicians. We will identify risk factors such as oppression and marginalization; socioeconomic status; and the impact of complex childhood trauma, sexual abuse, relationship stressors, intimate partner violence, and birth trauma on mental health. We will discuss assessment tools readily available to midwives. This presentation will go beyond screening clients for postpartum depression. We will explore the signs and symptoms of preexisting conditions and prenatal and postpartum mood disorders that are subtle and often overlooked. We will address how to access effective resources for clients. Register above at the Thursday entry. This short workshop focuses on skills such as initiating and supporting breastfeeding and breast care for midwifery clients, including human milk expression, handling and storage. Skills listed below will be taught, practiced and evaluated in the workshop. Students who show competency in the skills can have them “signed off” by the instructor in the PSGM if desired. What happens after the baby is born? Acquire the skills for the first hours postpartum in this workshop. Skills listed below will be taught, practiced and evaluated in the workshop. Students who show competency in the skills can have them “signed off” by the instructor in the PSGM if desired. Care after the birth is so important to nurture the new mother. Six-week postpartum history and exams and client education are included. Skills listed below will be taught, practiced and evaluated in the workshop. Students who show competency in the skills can have them “signed off” by the instructor in the PSGM if desired.